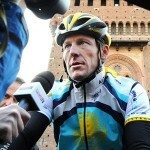 The internet has been abuzz with Lance Armstrong’s confession to Oprah. I, too, had something to say about it and I posted it at Kveller on Friday. Actually, I had an awful lot to say about it because there are so many ethical issues at stake. But I wanted to look at it from a different perspective. I wanted to explore if there was something positive to be learned from the act of admission. It surely is not the only lesson and it may not even be the most important one. It is, however, one deserving of attention. So head on over, take a look, and join the conversation.